Fisherman Tom Smith taking a salmon out of the haaf net. One of nineteen images of salmon fishing taken by local fisherman Alan Smith. Alan Smith’s oral history is in the archive. 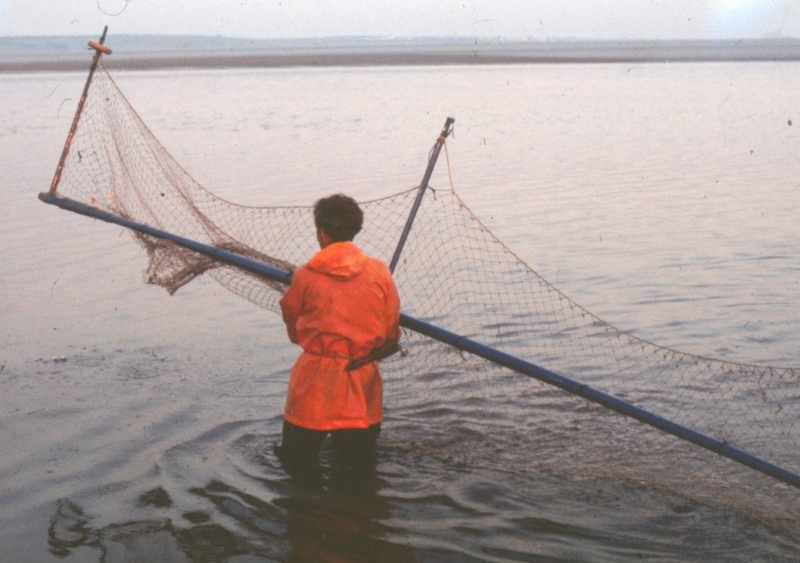 Haaf, or heave, netting is a traditional and long-established method of fishing for salmon and sea trout on the rivers of the North West, notably the Lune and Ribble. The word haaf means sea net; a net is mounted on a rectangular frame 18 feet long by 5 feet high, supported by three legs. This frame is placed across the current by a fisherman or fisherwoman standing behind the net in the cold water and holding the central upright. The fisher walks out into the flat, shallow waters of the sands and mudflats and places the haaf net in front facing either the incoming flood or outgoing ebb tides. The net streams out in the water and bags, or pokes, form in the net. As soon as a fish swims into the net the legs of the frame are allowed to float to the surface thereby trapping the fish, which is disabled by a blow from a wooden club called a nep, priest or killer. A rope is threaded through the gills of the fish, using a wooden needle, and tied to the waist of the fisher until he or she returns to the shore.